Dubai is aiming to become the world’s first city to have passenger-carrying drones operating in its skies. Speaking at a summit in the city on Monday the Emirate’s Roads and Transport Authority (RTA) said they are on track to launch them by July. The RTA have been working alongside Chinese firm EHang, whose autonomous aerial vehicle (AAV) the EHang 184 looks set to taxi passengers across Dubai’s impressive skyline. “The RTA is making every effort to start the operation of the AAV in July 2017,” RTA executive director and chair Mattar Al Tayer said at the World Government Summit in Dubai on Monday. Using a touch screen to select a preset destination, passengers will be able to travel in the vehicle for up to 30 minutes at a top speed of around 100kph (60mph), all overlooked by a ground-based control center. "It replicates Dubai Self-driving Transport Strategy aimed at transforming 25 per cent of total individual trips in Dubai into self-driving trips using various modes of transport by 2030,” Al Tayer said. "In case of any failure in the first propeller, there would be seven other propellers ready to complete the flight and a smooth landing, while mitigating the impact of the fault sustained by the first propeller." First unveiled at the Las Vegas CES tradeshow in January 2016, the EHang 184 is described by its creators as “the safest, eco-est and smartest low altitude autonomous aerial vehicle” for short to medium distance travel. The drone does not allow users to fly manually; an automated destination input/delivery system is designed to eliminate human error. FAA regulations prevented it from being legally tested in the US. 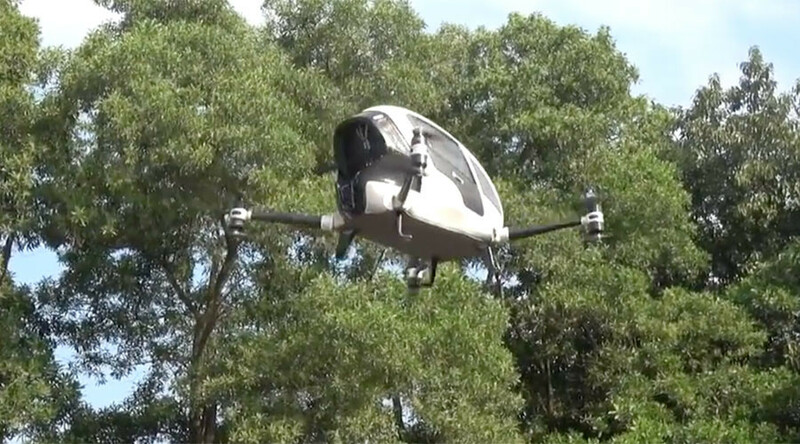 In Dubai, however, the Civil Aviation Authority partnered with EHang in testing the device. EHang was launched after company CEO Huazhi Hu lost his best friend and helicopter flight instructor in a flight accident in 2011 and sought to create a safer way to fly locally.